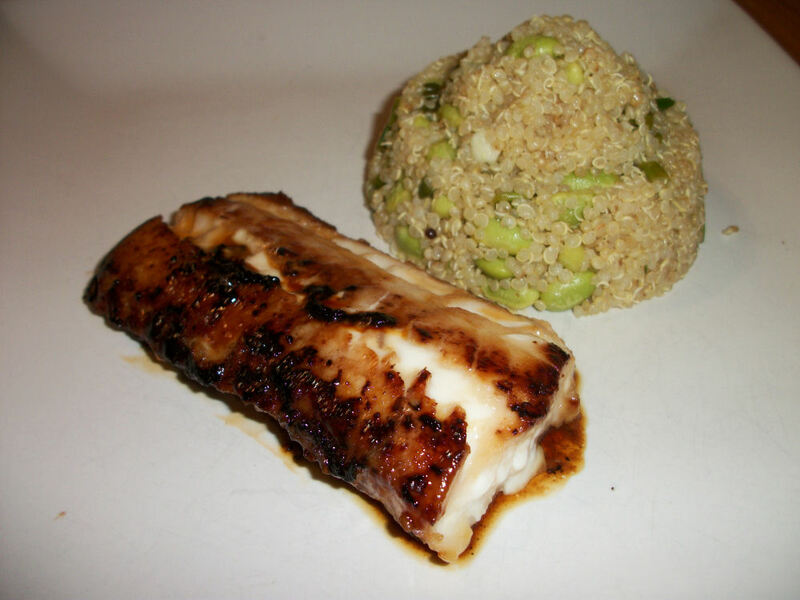 This is usually made with cod but Halibut was what was locally in season at the time I made this. With that season about to begin again I figured now is a good time for other folks to give this a go. This is a new spin on a centuries old Japanese recipe usually done with black cod. The first time I tried this was in a usually reasonably priced restaurant, I was blown away by the flavours….and then the price…15.00 for a tiny piece of fish, this was an appetizer portion. Yeah. Well, you can probably figure out what happened next. I craved this fish, this tasty expensive fish. It had drawn me in with it’s full amazing flavour, I was a slave to my need to have another taste but my frugal side screamed at me that there must be another way! So here we have it. My solution to the nobu cod dilemma with local fish. Note: the miso here is key, no miso no nobu. Say that last bit out loud…it’s kinda funny. Come on, now give it the Miyagi voice. There you have it. See? Now, to the nobu! Mix the last four ingredients in a container you intend to marinate the fish in. Preferably a container with a lid. Pat the fish dry and place in the container. Spoon some of the marinade on top to get full coverage. Cover and allow to sit in your fridge overnight or for 24 hours. Lightly wipe off the excess marinade. Lightly grill or pan fry the fish on both sides to sear, just until that surface turns brown you aren’t cooking it here. Transfer the fish to an oven preheated to 400F. Bake for 10-15 minutes. Oh what a tasty delight you are about to have! This is my new favourite fish dish. Loved it so much I made it for my family on christmas eve and now my fellow foodie sister wants the recipe. Sorry it took me so long to type it out for ya Laura! Each serving contains: 363 calories, 6.7 grams fat, 9.1 grams carbs, 60.5 grams protein, no fiber sadly. Have a nice high fibre side dish to compensate. I made us a tasty quinoa and edamame bean pilaf on the side. Goodtimes! A fun variation is to add 1 tsp sriracha sauce to the marinade, spicy nobu! Keep in mind you can do this recipe with pretty much any white fish you like, go nuts! This entry was posted in Craving Buster, Dinner and tagged fish, halibut, mirin, miso, wine. Bookmark the permalink.